Aim: The aim of this study was to evaluate the effect of pre and post fluoride therapy on the microleakage of composite resin and glass ionomer restorations. Materials and Methods: Class V cavities were prepared on the buccal surfaces of sixty extracted human third molars. Based on the restorative materials the samples were assigned into two essential groups of thirty and each of them divided into three subgroups regarding the mode of Acidulate Phosphate Fluoride (APF) gel usage. Fluoride therapy was applied pre and post restoration whether OptiBond Solo Plus as a total-etch adhesive system with Herculite XRV as a light cured composite resin or Fuji II LC glass ionomer as an restoration. Each essential group contained a control group without fluoride therapy. Thermo cycling was done, and then the rate of microleakage was evaluated by the fluid filtration method. Results: There were no significant differences by pre and post-treatment with APF on microleakage of composite resin restorations. A significant difference was found on microleakage of glass ionomer restorations based on different APF therapy. Conclusions: In contrast to composite resin restoration which had not influenced by fluoride therapy, after glass ionomer placement, the gel of fluoride led to significantly increase the microleakage of the restoration. Contemporaneously there are important difficulties to restoration of the cervical tooth caries and sometimes it is impossible. Restoration procedure in gingival area encounters particular problems such as moisture control, accessibility, being close to pulp and cervical margin of tooth which has a lot of organic contain. Use of fluoride mouth rinse daily, fluoride gel therapy in office and using fluoride varnish are different fluoride therapy methods which decreases teeth demineralization. , After introducing glass ionomor cements in 1972, they were popular because of its fluoride release property. Resin modified glass ionomer cement is like conventional type of glass ionomer but the former has more resin monomer content. Light cured composite restorations are the first choice as a restorative material in cervical caries to achieve maximum aesthetics. Hybrid composites which are used today have improved their strength and aesthetic more than microfilled composites. All resin-based restorative materials exhibit shrinkage and thus contribute to stress in the tooth-restoration boundary which results in gaps and microleakage. Microleakage test, which is so popular, is a simple way of assessing the adhesive system in a laboratory condition. The Fluid filtration method is an exact quantitative technique which is suitable for longitudinal studies. The influence of fluoride supplements on the surface of different restoration materials have been studied;  albeit, there is no study about the effect of pre and post topical fluoride therapy on the microleakage. Only in one research evaluated the effect of fluoride treatment before using bonding materials on microleakage, that concluded ineffectiveness of fluoride therapy before composite resin insersion. In some clinical situations, subjects underwent some sort of fluoride therapy just before or after inserting resin composite or glass ionomer restorations, and sometimes they just requested fluoride treatment as a caries prevention program. Evaluation the effect of pre and post topical fluoride treatment with APF on the marginal microleakage of composite resin and glass ionomer restorations were the goal of the study. In this in-vitro study, the 60 decay-free, freshly extracted, maxillary third molar teeth were disinfected, cleaned and maintained in 37° C and humidity of 100%. They were divided into two main random groups of thirty and then assigned in six subgroups (n=10). The APF gel (1.23% F, PH = 3.6-3.9, Dentsply, Petropolis, RJ, Brazil) was applied on teeth surfaces for 4 minutes, in the group 1. After that, Class V cavities were prepared on the buccal surfaces of each tooth. The straight fissure burs (No.010 SS White Burs, Inc. Lakewood, NJ, USA) were used with a high speed hand piece with air-water coolant to prepare the cavities. The cavity dimensions were 4×2×1.5mm and the cervical wall was prepared 0.5mm under the C.E.J. Two-step total-etch adhesive OptiBond Solo Plus (Kerr, USA) was used as an adhesive system, following the manufacturer instructions and then cavities were filled incrementally by the Herculite XRV composite resin, shade A3 (Kerr, USA). Each layer was light-cured for 20 seconds and 500mW/cm2 intensity by Optilux 500 (Demetron-Kerr, Orange, CA, USA). According [Figure 1], while in the first subgroup the APF gel was applied before composite restoration in the mentioned way, in the second subgroup, it was applied after composite restoration. The third subgroup was restored without APF gel application (Control). 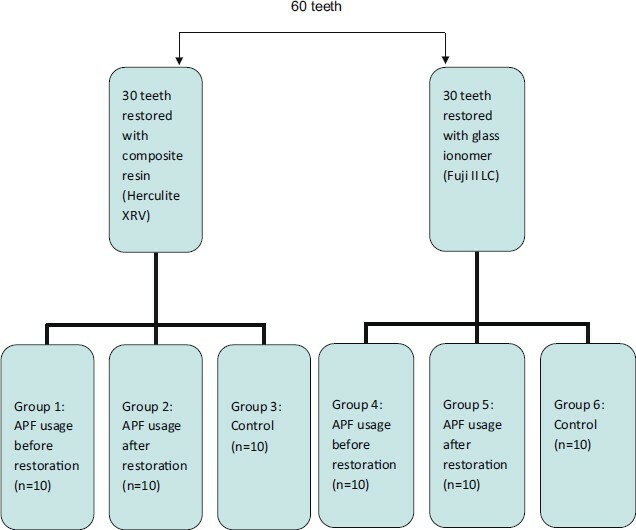 The other thirty teeth in the second main group were treated in just the same way as the first one except for using the glass ionomer (Fuji II LC, GC Corporation, Tokyo, Japan), which was applied based on the manufacturer΄s instruction, as restoration material instead of composite resin [Figure 1]. After storage in 37°C distilled water for 24 hours, the restorations were finished with aluminum oxide discs (Sof-Lex, 3M) and the specimens were thermo cycled at 5±10° C and 55±10° C for 1,000 cycles. This system is based on the evaluation of liquid transportation in the specimen, which was calculated from the movement of bubbles. The fluid must be pressed firmly to move through the specimen and as a result move the bubble. An oxygen tank with a manometer (for precise adjustment of pressure) should be used. A plastic tube must be connected to the oxygen source, and the end part should be connected to an erlen. Two holes must be created on the lid, one for Oxygen input and the other for emersion of fluid. A plastic tube was connected to a three-valve tube by a 0.5cm×2cm long latex pipe. A syringe was connected to the lower side of the three-valve tube to make an air bubble through the micro pipette. The upper side was connected to the specimens. The cyanoacrylate glue should be smeared on all of the system connections(Inter Lock, Japan) and multiple layers of Para film strips were covered all of them (Parafilm "M"; Laboratory film, Chicago, IL). These strips seal the connections in tubes and ensure a strong connection. Next, observation unit including a digital camera (Nikon D.90) must be connected to professional software (Photoshop 10.0) to measure the amount of bubble movements. A diamond disk which was mounted on a low speed hand pice used to sectioning the roots from the crowns to 2mm below the cemento-enamel junction (C.E.J). The pulpal soft tissue was removed and the area washed with an saline solution. A plexiglass surface was used as the base of the final crown segments as mentioned previously. The camera was zoomed and focused on the macrograph to produce a sharp image. By opening the faucet and removing the syringe, the pass in there was a straight connection between the tooth and the fluid filtration system. The main oxygen tank faucet was opened and remained in a constant, exact pressure ratio during the experiment. Then the digital camera started capturing the steps in every 2 minutes (2, 4, 6, 8 min). All the process was repeated for the system and all the data were saved to the P.C Hard Disc and the bubble movement was evaluated by the Photoshop software. Two samples of each group were treated for scanning electron microscopy (SEM) observation. The SEM observation represented that glass ionomer restorations had more gaps in margins than light cured composite restorations. In all groups, the fracture point was in teeth/adhesive edge or inside of adhesive. This result confirmed the microleakage data too [Figure 3]. The main target of this research was to study the effect of fluoride therapy by the APF on the marginal microleakage before and after composite resin and glass ionomer restorations. The dye penetration, bacterial penetration, radioisotopes, light microscopic methods or SEM methods have been used in studies to measure the leakage around restorative materials. The most important weak point of these methods is their qualitative rather than quantitative information; they reveal the presence or absence of leakage rather than the amount of it. It is recommended to use fluid filtration system to assure the confidence, reproducibility and comparability. Effective bonding is one of the most important factors of choosing and applying the tooth color restoration materials. 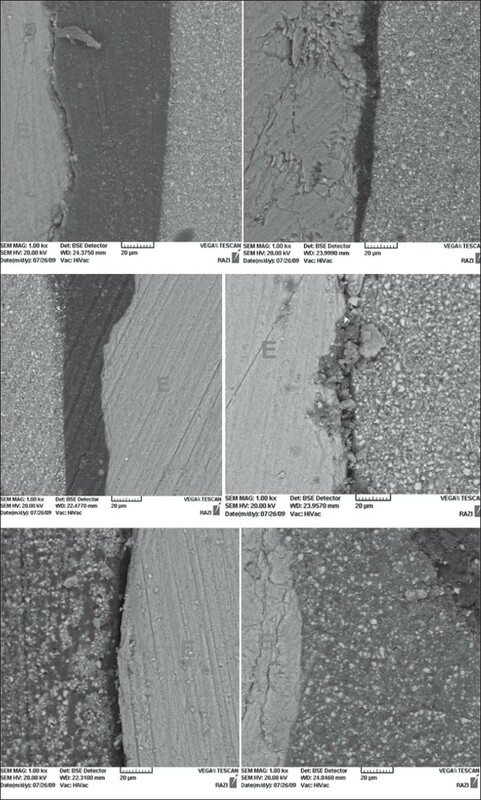 Microfilled composite is commonly advised for the root cavity lesions because of lower modulus of elasticity than hybrid composite resin.­  In this study was used adhesive system containing filler and microfilled composite resin, which have documented resistance to erosion. Maybe because of using these materials, APF therapy could not affect composite resin restoration microleakage. Just similar to a previous study, the result of the research showed pre-treatment with fluoride could not affect the marginal leakage. In several studies regarding filler particle destruction, treatment with APF results in significant changes on composite surface reflection. , These changes may happen because of the filler size and composition. Clinically, topical APF application can accelerate the defect of restoration surface, which is susceptible to more erosion, so gingival margins become rough. This situation causes bacterial aggregation and gingivitis. The APF gel contains phosphoric acid and can easily solute glass ionomer matrix. In the acidic condition, the leakage of main cathions (Na, Ca, Al, and St) of the matrix will react with the acid anions. This reaction results in the glass ionomer cement erosion. The erosion rating depends on the ability of acid complex formation and PK of the complex with ions. The acid which makes more stable complex with metal ions, solutes the glass ionomer cement more easily. In addition, the Hydrogen ion density (PH) affects the erosion process. , Glass ionomer cement needs to be mixed before using, and this process can make bulbs and porosity into the final mixture. Therefore, this material is more sensitive to APF than regular composite resin. The APF destruction rate on glass ionomer cement has been studied by Kramer et al. They showed that APF mouth rinse has more Glass ionomer (Fuji II LC) dissolution effect than the other similar mouth rinse following in the 72 hours soaking. The APF gel contains phosphoric acid which can etch the glass particle. The amount of glass particles which are etched in composites depends on the particles' structure. The particles containing Barium have the most sensitivity to APF. , In the acidic environment, the glass ionomer cement containing acid maleic copolymer is less resistant than the poly acrylic acid based one. The Fuji II LC which was used in this study, has based on poly acrylic acid, but is different in glass particle structure which makes the different matrix formation. So it can be eroded in a similar way to glass ionomer based on maleic acid. Erosion and destruction of glass ionomer could be intensified in different clinical conditions and variables of mouth environment such as in people who suffer from Xerostomia. Decline in resin modified glass ionomer restoration bond strength was mentioned because of varnish fluoride using in Korkmaz and Baseren study. Treatment with APF before bonding process related to fissure sealant treatment did not reduce the bond strength of it. However, in this research was not seen more microleakage in the group which received APF therapy before glass ionomer placement than the control group. Although bond strength is not related to microleakage significantly,  but Cacciafesta mentioned pre-treatment fluoride therapy is a reason for decrease in bond strength of glass ionomer restorations. Fluoridated appetites crystals are cited as the other factor that make less number of chemical bonds than hydroxy appetites. No publication have been found until now, which reported the evaluation of pre and post fluoride therapy effect on composite resin and glass ionomer restorations microleakage. So the results of the study couldn't be compared with others. Using rebonding technique which is usual in composite resin restorations advocate the existence of the glass ionomer restoration when undergoes fluoride therapy. Probably the neutral form of fluoride supplement like NaF is preferred for patients who have glass ionomer restorations and specifically APF is specially forbidden in these subjects. It is suggested that this study be followed by other researches that evaluating the influence of the other kind of fluoride supplements applied in different time on various type of restoration materials interfaces. With regard to limitation of this study, it can be concluded that in contrast to the pre-treatment fluoride therapy on glass ionomer restoration, post-treatment with APF increased the restorative microleakage. Fluoride therapy did not influence the marginal microleakage of composite resin restorations, either pre or post operation. Funding for this research was provided by the Research Council of Mashhad University of Medical Sciences. 1. Setien V, Armstrong SR, Vargas MA. Conservative restoration of proximal-cervical lesions. Oper Dent 2003;28:321-3. 2. Burgess JO, Gallo JR. Treating root-surface caries. Dent Clin North Am 2002;46:385-404. 3. 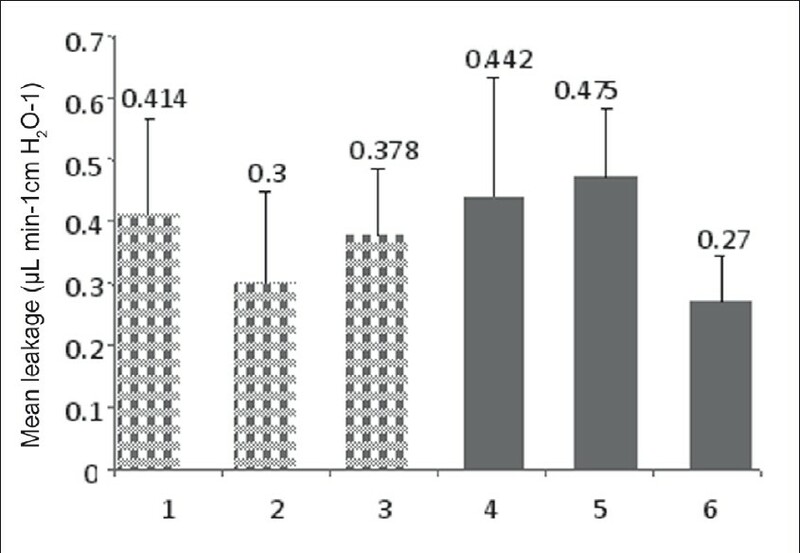 Korkmaz Y, Baseren M. Effect of antibacterial varnishes applied to root dentin on shear bond strength of tooth-colored restorative materials. Oper Dent 2008;33:65-71. 4. Shu M, Pearce EI, Sissons CH, Coote GE, Miller JH. Fluoride distribution in sound and carious root tissues of human teeth. Caries Res 1998;32:239-46. 5. McLean JW, Nicholson JW, Wilson AD. Proposed nomenclature for glass-ionomer dental cements and related materials. Quintessence Int 1994;25:587-9. 6. Jones JA, Mash LK, Niessen LC. Restorative considerations for special needs patients. Dent Clin North Am 1993;37:483-95. 7. Hilton TJ. Can modern restorative procedures and materials reliably seal cavities? In vitro investigations: Part 1. Am J Dent 2002;15:198-210. 8. Wu MK, De gee AJ, Wesselink PR, Moorer WR. Fluid transport and bacterial penetration along root canal fillings. Int Endod J 1993;26:203-8. 9. Dionysopoulos P, Gerasimou P, Tolidis K. The effect of home-use fluoride gels on glass-ionomer, compomer and composite resin restorations. J Oral Rehabil 2003;30:683-9. 10. Nystrom GP, Holtan JR, Olin PS, Douglas WH. Technical note: Fluoride pre-treatment effects on microleakage of a resin bonding agent. Dent Mater 1989;5:359-60. 11. Prati C, Tao L, Simpson M, Pashley DH. Permeability and microleakage of Class II resin composite restorations. J Dent 1994;22:49-56. 12. Youngson CC, Jones JC, Fox K, Smith IS, Wood DJ, Gale M. A fluid filtration and clearing technique to assess microleakage associated with three dentine bonding systems. J Dent 1999;27:223-33. 13. Kula K, Nelson S, Thompson V. In vitro effect of APF gel on three composite resins. Dent Res 1983;62:846-49. 14. Earl MS, Ibbetson RJ. The clinical disintegration of a glass-ionomer cement. Br Dent J 1986;161:287-91. 15. Matsuya S, Matsuya Y, Yamamoto Y, Yamane M. Erosion process of a glass ionomer cement in organic acids. Dent Mater J 1984;3:210-9. 16. Schmitt W, Purrmann R, Jochun P, Gasser O. Calcium depleted aluminum fluorosilicate glass powder for use in dental of bone cements. US Patent 1983 No. 4, 376 835. 17. Kramer KL, Wolff MS, Gale EN, Osborne JW. The effect of fluoride mouth rinses on the solubility of cements. J Dent Res 1986;65:777-9. 18. Council on Dental Materials, Instruments, and Equipment. Council on Dental Therapeutics. Status report: Effect of acidulated phosphate fluoride on porcelain and composite restorations. J Am Dent Assoc 1988;116:5. 19. Kula K, Nelson S, Kula T, Thompson V. In vitro effect of acidulated phosphate fluoride gel on the surface of composites with different filler particles. J Prosthet Dent 1986;56:161-9. 20. Setchell DJ, Teo CK, Khun AT. The relative solubilities of four modern glass-ionomer cements. Br Dent J 1985;158:220-2. 21. Wood RE, Maxymiw WG, McComb D. A clinical comparison of glass ionomer (polyalkenoate) and silver amalgam restorations in the treatment of Class 5 caries in xerostomic head and neck cancer patients. Oper Dent 1993;18:94-102. 22. El-Housseiny AA, Sharaf AA. Evaluation of fissure sealant applied to topical fluoride treated teeth. J Clin Pediatr Dent 2005;29:215-9. 23. Heintze SD. Systematic reviews: I, The correlation between laboratory tests on marginal quality and bond strength. II. The correlation between marginal quality and clinical outcome. J Adhes Dent 2007;9 Suppl 1:77-106. 24. Cacciafesta V, Sfondrini MF, Calvi D, Scribante A. Effect of fluoride application on shear bond strength of brackets bonded with a resin-modified glass-ionomer. Am J Orthod Dentofacial Orthop 2005;127:580-3. 25. Jones SP, Cheuk GC, Georgiou G, Moles DR. Comparison of fluoridated apatites with pur hydroxyapatite as potential biomimetic alternatives to enamel for laboratory-based bond strength studies. Aust Orthod J 2009;25:12-8. Shabzendedar, M. and Moosavi, H. and Talbi, M. and Sharifi, M.